Well. I have completed the lacy peplum on my cardigan, and I’m sorry to report that it is fraught with problems. I shouldn't blame the peplum itself, of course, when fault actually lies with the chart. It is a very simple chart and the errors aren’t until the end, but that may have made it even more frustrating. There I was knitting along, almost at the end, and all of a sudden – stymied! It is a 20-row chart, and on row 17 I realized that something was horribly wrong. The number of stitches I had on my needles did not match the chart. It was only off by one, but it was the same for every repeat of the lace pattern (6 total) so I was sure the problem was not me making the same error 6 times. I studied the chart and, sure enough, based on the previous rows, the stitch count for row 17 was incorrect. So I just winged it, because it was rather minor and I was SO close to the end. The next problem was that in rows 17 and 19 each lace repeat begins and ends with a yarn over – that means there are places where there are two YOs in a row, resulting in a big gaping hole. Intentional? Who knows. As I studied my knitting, a third issue became apparent. 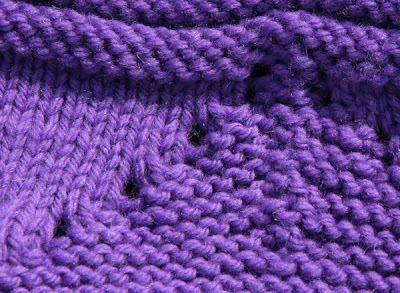 The eyelets made from all those YOs are supposed to make nice even diagonal lines and they do not – they are staggered in groups of 2 eyelets on top of each other. It is very difficult to see, but trust me - each of the eyelets you see has another directly below it. If I pull gently on the fabric, they become more visible, and probably will with blocking too. The picture in the book clearly shows lovely rows of 10 eyelets, all perfectly diagonal as they were intended. 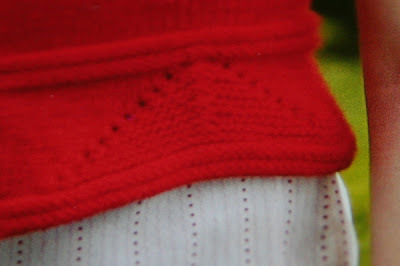 But when I looked on Ravelry, every single finished version of this sweater looked like mine – a veritable stairstep of eyelets stacked in pairs in such a way that when you don’t look closely it looks like a diagonal line of just 5 eyelets. Not one looked like the sweater pictured in the book. I can live with how it looks, but I'm not at all happy about the fact that the peplum on the original sweater was obviously not knit from the same chart published in the book. This is all especially disappointing because Fitted Knits has been out for a few years and an errata is available – but it contains nothing about this chart. This is also one of the most popular patterns from the book, so it is even more frustrating that corrections haven’t been provided. Nevertheless, the sweater is coming out well. Luckily the peplum is just a small part of the sweater that will be down by my waist and therefore not very noticeable. (Except by anyone who is reading this post right now and will consequently spot my faulty eyelets immediately.) 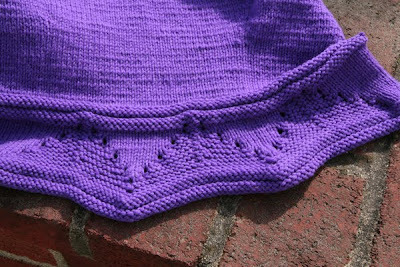 I’m hoping it is finished soon because I’ve really been wanting to wear it – the weather is perfect for a short-sleeved cardigan right now! Oh! That is quite annoying. I understand people make mistakes in patterns, but for them to not have caught that in the errata is doubly frustrating. 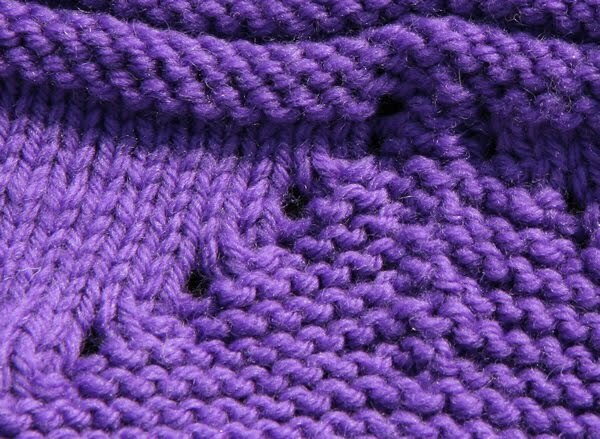 Have you commented on the pattern in Ravelry? I'm planning to leave a comment on Ravelry when I'm completely done, but someone else already has. There has also been a bit of discussion on the boards, and I thought someone said they had sent the designer an email.